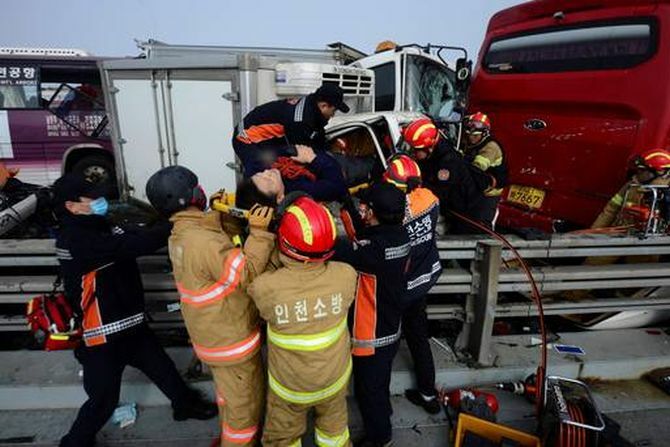 Two people have been killed and more than 60 injured in a crash involving about 100 vehicles in foggy weather on a bridge near South Korea’s Incheon International Airport. 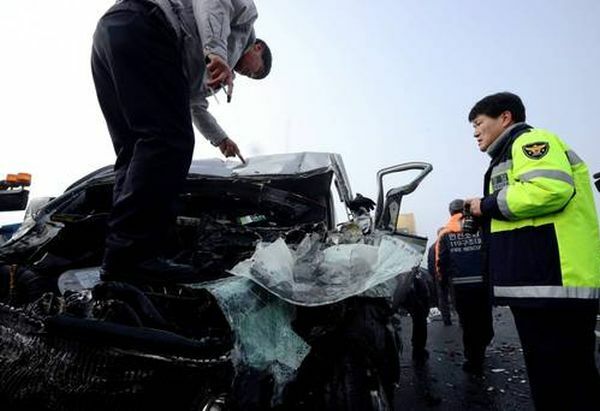 The multiple collision on Wednesday occurred in heavy fog on the Seoul-bound lane of a bridge that forms part of the main expressway linking Incheon airport with the capital. The pile-up appeared to have been started when a limousine ran into the back of a car, an Incheon police station spokesman said. “More than 100 vehicles were involved,” he said, adding that the foggy conditions meant drivers could only see 15 metres in front of them. TV footage showed emergency rescue workers trying to access the mass of twisted and crumpled wrecks on the fog-covered bridge. The fog delayed the departure of 18 flights and the arrival of seven flights during the morning, airport spokesman Cho Sang-hyun said. 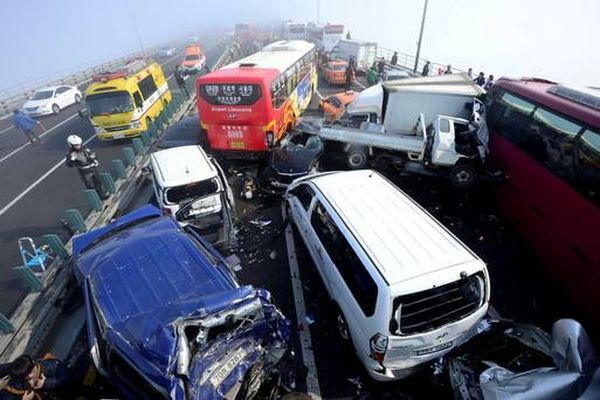 South Korea experienced a similar accident in 2006 when a 29-car pile-up in foggy weather at another bridge left 11 people dead and more than 50 injured. 1) In October 1991, one person died and another 64 were injured when 150 cars piled-up owing to fog on the A15 Motorway near Ochten, Netherlands. 2) 2 people died and another 90 were injured when 200 cars were involved in a crash on the Interstate 10 in Mobile, Alabama, United States in March 1995. 3) Back in November 2002, 216 vehicles were involved in a pile-up in Los Angeles, California. 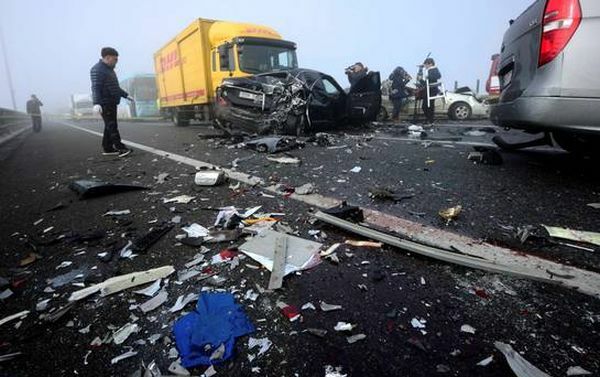 4) Dozens of people were injured, 10 critically, when 259 vehicles were involved in a pile-up due to heavy rain on the German Autobahn A2 near Braunschweig in Lower Saxony in 2009. 5) In January 2015, nearly 200 vehicles, including 76 semi trucks, were involved in a pileup on Interstate 94 near Galesburg, Michigan, amidst a heavy snowstorm that brought nearly a foot of snow to the area. One of the trucks was carrying a load of fireworks, which caught fire and exploded, injuring two firefighters. The only fatality was a 57-year-old truck driver from Quebec, Canada. Do explosive openers make Aus, SA favourites?